New York : Fourth Estate, 2005. "This book tells the story of the many brilliant, often eccentric scientists who fought against the establishment idea of an eternal and unchanging cosmos. From such early Greek cosmologists as Anaximander to recent satellite measurements taken deep in space, Big Bang is a narrative full of anecdotes and personal histories. Simon Singh tells the centuries-long story of mankind's attempt to understand how the universe came to be, a story which itself begins some 14 billion years ago (give or take a billion years)." --BOOK JACKET. Long, slow-building history of the BB theory, written for the masses but blessedly embracive of metric units. For this reader with a lot formal education, but very little of it in the physical sciences, Simon Singh's `Big Bang' was phenomenally interesting, engaging, intellectually stimulating, readable, and educational. Others with more background in cosmology may find it too basic. 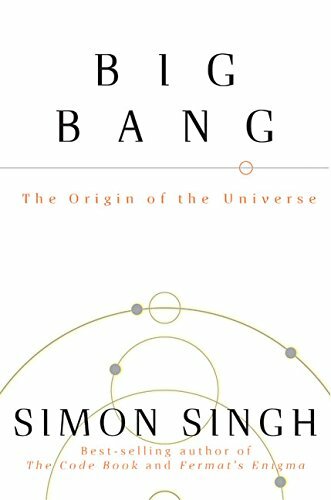 Singh takes the reader through the history of cosmology as he builds toward an explanation of the Big Bang theory. The opening chapter explains the ancient's earth-centered (and common sensical) view of the universe and its downfall at the hands of Copernicus, Brahe, Kepler and Galileo. Later chapters follow the disproof of ether, Einstein's special and general theories of relativity, and the `great debate' between the supporters of a static universe and Lemaitre and others who supported the idea of an expanding (Big Bang) universe. A large portion of the book follows the scientific efforts to gather evidence to support one view or the other. The renowned Edwin Hubble and the less so Henrietta Leavitt played key roles in finally providing enough evidence supporting the Big Bang theory to at least make it a credible argument. The remainder of the book follows the debate between the solid state theorists led by Fred Hoyle and the Big Bang backers led first by Gamow and Alpher, but later by others who resolved some of the nagging doubts about the theory, for example, the crucial 1992 proof of tiny variations in cosmic microwave background radiation. Each chapter (at least in the P.S. version) has handy summary notes. Singh provides a useful glossary as well as recommended further readings for each chapter. I generally read 50-75 books a year and rate The Big Bang as one of my top five books of the year. Five measly stars don't do it justice. I will resist the temptation to rate as a supernova, but this book greatly enhanced my understanding of the world around us and was a joy to read. Well written like all of Singh's books. Covers a lot more than the Big Bang, including most of modern astronomical physics. That's a good thing. Well-written exposition on a potentially very hard topic to understand. Singh's track record is 100% - every book by him has been an entertaining and informative one. In tis great book Singh guides you through the history of cosmology and astronomy seeking the big questions. How the univesre works and evolves? How it started (if ever...)? Well written, easy to understand for everyone... simply great. Phew! Finished. All 500 pages. Any non-specialist who makes it through this "popular science book" deserves a medal and a stiff drink! It seems to me that behind most good writers - and Singh certainly is that, with a clear and engaging style - is a good editor. Sadly, I think he was let down by his editor here, so that the balance of this book seems, to this interested lay reader at least, to be all wrong. As Singh himself admits in the 15 odd pages of "extras", he has found it difficult to decide what to put in and what to leave out. It shows. Thus, we are treated to an exhaustive (and sometimes exhausting) history of many of the important discoveries in astronomy and physics, from Eratosthenes to the COBE satellite, before we are even told just what the Big Bang model of the origin of the universe is. I would have thought it would have been much more useful to the average reader to have started with the rather neat summary of the model on pp. 472 and 473 of the 23 page epilogue, which appears to be a paraphrase of the 1992 The Independent article announcing the findings of the COBE satellite providing evidence for the existence of the denser than average regions of the universe 300,000 years after the singularity of the Big Bang necessary for the formation of the first stars and galaxies after the first billion years. From such an admirably clear statement, it would have been possible, in succeeding chapters, to set out the supporting evidence for the model in the form of clear and simple statements of the important theories and building blocks underpinning the model (eg., the special and general theories of relativity, the confirmation of multiple galaxies, spectroscopy, Hubble's Law, the structure of the atom, cosmic microwave background radiation, nucleosynthesis, and the abovementioned variations in density). After a while I became slightly irritated by his sections beginning, for example: "It may seem like a long time since I have mentioned astrophysics but, ...". Whilst I quite liked the potted histories of the various personalities involved, I do feel that these add to the somewhat confused, and possibly confusing, nature of this book. For example, the beginner's introduction to the special theory of relativity has, in my view, been done better elsewhere, such as in Paul Davies' "About time". A very readable and understandable history of the Big Bang theory. I would have preferred more detail of the actual theory itself as I still have one big question regarding what 'space expanding' actually means. Singh has written a very good piece of popular science in Big Bang. While I knew the science he introduced, I loved the way he laid it out for the general reader with clear explanations, good illustrations, and a minimum of equations. Told in chronological order from the Greek philosophers to the cosmologists of today, Big Bang is also a history of science and an explanation of how science is done. It was also a good review for me of relativity and cosmology. To me, the really great thing was all the details about the people and how they explored their ideas that I had not run across before reading this book. Additionally there were a wealth of quotes from scientists and non-scientists to introduce and illuminate the various sections. A good, non-mathematical summary of the history of the development of the Big Bang Theory and how it has become established as the pre-eminent theory in explaining the origins of the universe. Singh keep the tone light an simple. I found his style really engaging and illuminating. Science needs more writers like him to boost its popularity with the general public. So it is with Simon Singh’s Big Bang. This is not a discussion of the details of Big Bang cosmology (although the Big Bang figures in the final chapters), but rather a history of the history of the universe, starting with miscellaneous mythologies through the Greeks to Archbishop Ussher to Einstein and eventually the Cosmic Microwave Background versus Fred Hoyle. Capsule biographies of the various participants are included, with a number of important ones I’d never heard of. How can galaxies be moving away from us faster than the speed of light? What’s outside the edge of the Universe that it’s expanding into? Two interesting narratives here - the origins of the universe, and how people figured it out eventually. Convenient 'notes' section at the end of every chapter. A very thorough, detailed history of cosmology. Great introduction for those with an interest in cosmology and astrophysics.